with 3 different and specially pattern, it is perfect to decorate your home, office, bar. Coasters upper layer is absorbent ceramic, which will keep your furniture dry. really very flat and flat and made of fine cork. Nothing slips and the risk of spillage is zero. Environmental protection materials, of course, low carbon, non-toxic, waterproof and moisture-proof. The multiple use stone coasters is much more ecological than using disposable paper coasters. If coffee or dark drink splashed on the coaster, we recommend you to wash the coaster with water immediately. ★ STRONG ABSORBENT CERAMIC - Coaster upper layer is absorbent ceramic, which absorb ability better than normal Silicone coaster to keep your table dry. ★ ANTI WEAR CORK - The back of coaster is cork to prevent table from Scratched and worn. And also provide additional gripping to the land, tightly stick to the desktop, easily handles bumps and drops. 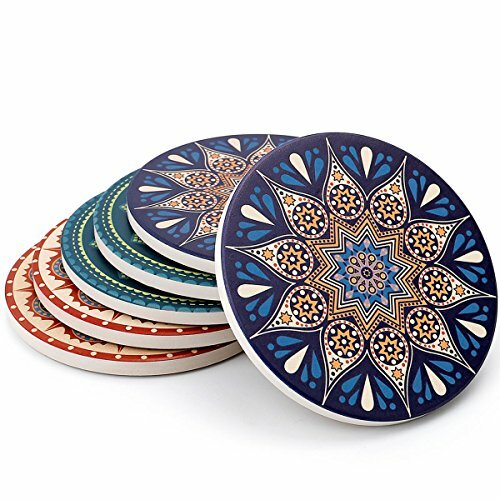 ★ BEAUTIFUL DECORATION AND PRESENTS - Set of 6, the frosted glaze on the surface of the coaster keeps the pattern bright and never fades that is great to decorate your kitchen, living room, bedroom or office and so on. Perfect to sent to friends as a gift. ★ SUITABLE SIZE & EASY TO CLEAN - Coaster diameter 4inch, suitable for all glasses, mug, cup. Easy to clean, more convenient to clean than silicone coaster, just rinse it by water. If you have any questions about this product by Teocera, contact us by completing and submitting the form below. If you are looking for a specif part number, please include it with your message.